In the last "A Look Back" Post, we'd survived an "encounter" with an elk and were on our way out of Jasper National Park and into Banff. 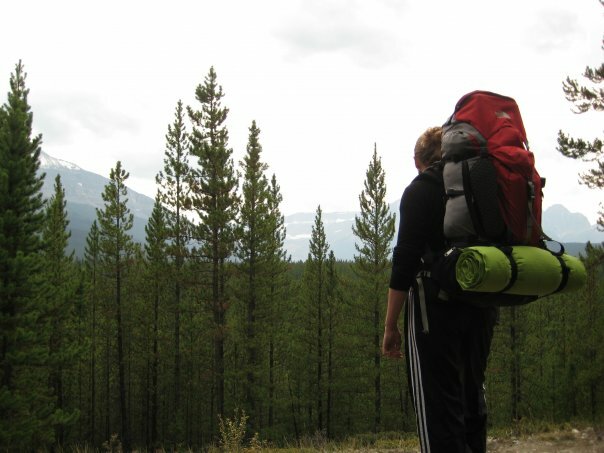 We found, thanks to a friendly Parks Canada Ranger, an amazing backpacking route and stunning scenery. Instead of staying in another relatively tame campground, we opted to stop at the Columbia Icefield Visitors Centre to investigate overnight backcountry trips. It took us at least ten minutes to convince the friendly Parks Canada ranger of our desire to see the real Banff National Park and our willingness to walk more than one kilometer uphill. 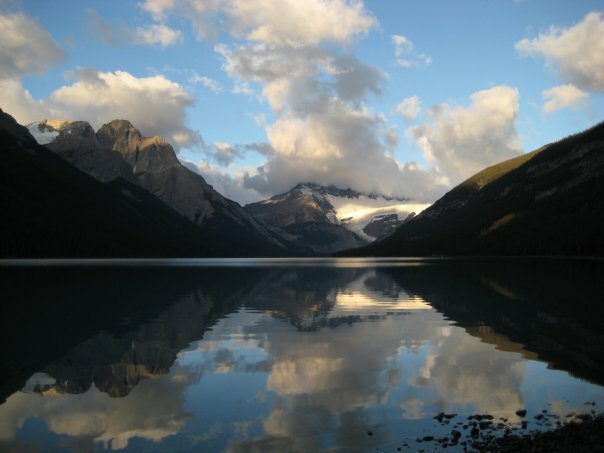 After he decided we were worthy of real advice, he pointed out Glacier Lake on a large map, describing views of one of the most beautiful, pristine spots within a day’s reach of the Icefields Parkway. More than convinced that this was our trip, we secured a backcountry camping permit and were on our way. The trail to Glacier lake is 8.9km (5.5 mi) one way, beginning at a trailhead just north of Saskatchewan Crossing on the Icefields Parkway. The trail winds through deep woods littered with moss and brightly colored mushrooms, ascends 210 meters, then quickly descends 220 meters to the end of a massive neon blue lake with an alpine glacier towering at the opposite end. My jaw hit the ground when we came over the hill, out of the woods, and on to the banks of Glacier Lake. It didn't seem real. It just looked too perfect, aside from that it was windy and the sky looked like rain. I immediately layered up and started making dinner while Dan set up the tent. He wanted a fire, but I protested because of the wind and general lack of motivation to be outside in the increasingly chilly weather. We crawled into our sleeping bags a bit before nightfall. I woke up several hours into the night with a miserably stuffy nose, lamenting about how it was a perfect time to get sick. The sky cleared by morning, though my sinuses did not. I got up and Dan had already retrieved the food from the bear-proof storage area just up the hill - a large metal pole rigged with pulleys to raise tempting morsels above the bears' heads. Glacier Lake, though technically a backcountry campground, was deserted assumedly because it takes a little effort to get there. I went to a small underground spring to fill out Nalgenes while Dan built a whopper of a fire at the lake's edge. Driftwood burns like no other. We'd set up our fire and breakfast spot a good distance from the tent, though it was still in view. I shut out the chilly morning air by taking my sleeping bag to the breakfast "table" and spending as much time in it as possible. The sunshine was divine, and the picture perfect lake looked just as the ranger had described. We packed up and made the hike back to the parking lot in under two hours, but it was rough. Aside from feeling less than at my best, it was the first exercise we'd had in a week and my legs sure knew it. I was secretly glad to be sick; it was an excuse to find a cheap motel, take a hot shower, and sleep in a real bed. My sense of adventure was waning slightly, along with my ability to breathe. We drove down south to Jasper, the town. It can be seen, depending on your perspective, as a little oasis in a vast landscape of uncivilized, unpopulated wilderness, or a blemish. It's nestled among the great Canadian Rockies, which I hoped meant it was rustic. On the contrary, I found it full of expensive boutiques, inns, five star restaurants and women in fuzzy boots with pompoms on the laces, which they probably didn't have to tie. We spend what was left of the stunningly beautiful afternoon wandering the streets, staring at the mountains in the distance, and looking for accommodations. We came upon what Dan referred to as a "super hostel," apparently nicer than most despite being under construction, and I slept relatively soundly on a real bed full of pizza and hard cider. Tomorrow, on to Calgary and wherever we feel like going. I could get used to this.